History & Designs of Illuminated Manuscripts, High Cross Sculptures: c.500-900. Masterpiece of Celtic-style religious art. The evolution of Celtic art was significantly influenced by military and political events. By the mid-first century CE most of the Celtic lands including much of Britain were absorbed into the Roman Empire, and only Ireland and the north of Britain remained outside it. For most of the period the northern frontier of the Empire in Britain was Hadrian's Wall and the area bordering it was subject to massive Roman influence. Indeed, the Celtic tribes living there may have been in alliance with Rome. This region seems to have played a significant part in the development of new, partly romanized fashions amongst the Celtic peoples of the North and West. Within the province of Britain, Celtic culture and language survived to some extent and it is probable that many of the great landowners were the romanized descendants of native leaders. By the fourth century, the troubles which beset the Empire left the province in Britain vulnerable to attack by pirates, and in Ireland, by the Picts from Scotland and by the Germanic Saxons. The picture is very confused, however, and some of these raiders may also have served from time to time as mercenaries defending the colony and may have been settled in Britain for that very purpose. In 407, the legions withdrew and about 410 the Emperor Honorius advised the Britons to look to their own defence. This they did and it now seems clear that a high level of romanized culture was maintained by native rulers well into the sixth century. Native traditions appear to have reasserted themselves in this process and independent Celtic speaking kingdoms emerged. Leaders from beyond Hadrian's Wall established themselves in Wales while the Irish settled in colonies in Cornwall, Wales and Western Scotland. The Irish kingdom of Dal Riada gradually extended its influence over most of the highlands of Scotland. The Picts remained powerful throughout this period and frequently proved a threat to the rich lands to the south. The rulers of southern Britain continued to bring in and settle Germanic mercenaries to help defend their lands. This proved to be unwise as many of the mercenaries began to seize power for themselves and to bring reinforcements from their homelands and eventually conquer the area that we now know as England. The conquest was gradual and it was occasionally halted, but by the end of the sixth century the political structure of early mediaeval times had been established. The conquerors - the Anglo-Saxons as they were later called - probably absorbed much of the native population. Christianity was well-established in Roman Britain by the fifth century, but the Anglo-Saxons reintroduced paganism to the areas which they conquered. Ireland, which had remained outside the Roman Empire, maintained its traditional way of life but was christianized during the fifth century by missionaries from Britain and Gaul. The history of Celtic art at this period is confused but broadly speaking in fifth and sixth century Britain and Ireland, schools of Celtic metalworking existed based on La Tene traditions which seem to have been preserved in a relatively pure form in the north and west of Britain and in Ireland. In southern Britain romanized traditions exerted their influence and this permeated the workshops outside the colony. Thus a modified version of the La Tene style developed. Technological influences also came from Roman art. Craftsmen in metalwork began to experiment in working with silver, although tinning and silvering may have been adopted to imitate the effect of silver which may have been in short supply. Millefiori glass came into use. The style is best referred to as Ultimate La Tene and, in the later sixth and seventh centuries with the adoption of new colours in enamelling, extremely florid effects were achieved by bronze smiths. Ornament was dominated by trumpet scrolls, fine spirals often designed to be seen as a reserved line of metal in a field of red enamel and this motif is best exemplified on the escutcheens of a series of vessels called "hanging bowls". The majority of these bowls are from pagan Anglo-Saxon cemeteries in eastern and southern England. Their decoration is distinctively Celtic in character and it has often been argued that they represent booty taken by the conquerors from the Celtic lands to the west. It is, however, perfectly possible that many were made by British craftsmen working locally for new, Germanic patrons. Workshops capable of producing similar material were operating in western Britain and Ireland at this time, but finds of bowls or bowl fragments are very rare. In Ireland, brooches and other objects carry variants of the early hanging-bowl style and this art appears on at least one piece of monumental sculpture, the Mullaghmast stone, Co. Kildare, an object which was certainly carved in the locality. After a century or so of obscurity the Irish Church emerged into the full light of history as strongly monastic in character. With the foundation of St. Columba's monastery of Iona off the west coast of Scotland in 562, Irish monks entered into a missionary phase which led them to found monasteries widely in western Europe which in turn broadened the horizons of the homeland. The mission of Aidan of Iona in the 630s to the ancient kingdom of Northumbria in northern England was especially important in the later development of insular Celtic art. The Irish missionaries in Britain came into contact with the art of the Anglo-Saxons, who practised a colourful animal style in metalwork. On the Continent, the missionaries would have seen similar jewellery amongst the Franks and Lombards. All of these enabled the monastic houses to foster a new hybrid style of early Christian art which, with variations, was shared by manuscript illuminators, metalworkers and later, monumental sculptors, in northern Britain and Ireland. In this art, Ultimate La Tene scrollwork remained a vital decorative element, but during the seventh century, filigree, complex casting imitating deep engraving, die-stamping of decorative foils, gilding and granulation were also borrowed by Celtic craftsmen from the Germanic world and, with these, they produced dazzling and highly colourful examples of illuminated manuscripts. The earliest great product of this style to survive is the Gospel manuscript The Book of Durrow, painted in the later seventh century and preserved at the monastery of Durrow, Co. Offaly, Ireland, until the seventeenth century. Each Gospel is preceded by a decorative "carpet" page (see example, pictured above) - one displays interlace, another animal ornament of Germanic inspiration while a third contains a complicated composition of trumpet scrolls and spirals cunningly joined together to form an elaborate pattern of linked roundels. A fourth page is composed of a pattern of crosses. The interlace and strangely stylized Evangelist symbols were derived from Greek art and Etruscan motifs. The style reached maturity with the Gospels painted at Lindisfarne, Northumbria in about 700. Here the Celtic tradition of constructing ornament with the use of a compass is evident not only in the Ultimate La Tene compositions but also in the animal ornaments of its great cross-carpet page. In metalwork, the refinement of the Gospels is matched by the great silver brooch, from Hunterston in Ayrshire, Scotland, by the Tara Brooch fibula from Bettystown, Co. Meath and by the door ornaments from Donore, Co. Meath. The last two objects, housed in the National Museum of Ireland, are both eighth century products of the Irish midlands school. The Late La Tene ornament of the manuscript and the metal objects when examined closely are found to be heavily influenced by Germanic beast motifs. The spiral endings are often no longer subtly shown bird-heads or petal-like lobes but massive snouted beast-heads, sometimes with a blunt crest and open jaws. They are severely stylized and often difficult to identify at first. A disc from the Donore find bears an elaborate composition of trumpet scrolls in tinned bronze seen as a reserve against a richly textured background. This beautiful pattern may be compared with the sophistication of the great Chi-Rho page (pictured above) of the Gospel book, the Book of Kells, the great masterpiece of Irish Biblical art, which was preserved at the nearby monastery of Kells, Co. Meath for many centuries. Other famous religious manuscripts illustrated with Celtic designs include the Cathach of St. Columba (early 7th century), the Lindisfarne Gospels (c.698-700), the Echternach Gospels (c.700), and the Lichfield Gospels (c.730). See also: History of Illuminated Manuscripts (600-1200) and Making of Illuminated Manuscripts. The Book of Kells owes much to the art of Pictland and its decoration echoes a magnificent series of carved slabs in Scotland. The latter, like the manuscript, are not dated with certainty but many would appear to be of the eighth or ninth century. They are characterized by animal ornament, figured scenes, often with hunting or processional themes, and frequently with elaborate Ultimate La Tene compositions of outstanding virtuosity. The slab from Hilton of Cadbole, Rossshire, Scotland is an accomplished rendering of the repertoire which also includes the inhabited vine scroll of Mediterranean origin, interlace and a series of enigmatic symbols. The virtuosity of Pictish art can be seen also in the metalwork from the great hoard from St. Ninian's Isle, hidden about 800 and in the carved wooden box from Birsay, Orkney. The art of Kells has its metalwork equivalents in Ireland, for example the great Ardagh Chalice, Co. Limerick, and on the Derrynaflan Chalice, Co. Tipperary, both dating to the eighth century, while there are elaborate Ultimate La Tene compositions in stamped silver on the later Moylough Belt Shrine from Co Sligo, Ireland. The interaction of Celtic and Anglo-Saxon traditions begun in the seventh century continued into the eighth and ninth centuries and Ultimate La Tene decoration occurs on some Anglo-Saxon monuments, for example, the carved stone frieze of the Church of Breedon-on-the-Hill at Leicestershire, England, and on the Gandersheim ivory casket now preserved at Braunschweig, Germany, but originally imported from England. In the eighth and, perhaps, early ninth century it survives in Anglo-Saxon manuscripts for example, in the Codex Aureus now in the Royal Library, Stockholm, in the Barberini Gospels in the Vatican Library and in the psalter, Cotton Vespasian, in the British Library. Mediterranean influences such as the occasional use of the vine-scroll motif on Irish sculptures were transmitted to Celtic craftsmen via Anglo-Saxon England. The Viking raids on Britain and Ireland began in the later eighth century and there is no doubt that they were very disruptive. A decline in quality of workmanship is detectable on major metalwork pieces such as the Derrynaflan Chalice. Numerous metal objects of Irish, Scottish and Northumbrian manufacture have been found in Viking graves in Norway and testify in part to the destructive and negative effects of these Nordic intruders, despite the independent contributions of Viking art. Irish sculpture - in the form of the ringed High Crosses - reaches a high standard in the later eighth and ninth centuries. Many of the crosses are devoted to Christian scriptural themes but one early group, probably mostly ninth century in date, is dominated by abstract interlace ornament, Ultimate La Tene animal interlace, and key- and fret-patterns. Pure ornament plays a major part also on the crosses with figured scenes and frequently occurs in the form of bossed fleshy scrolls, as on the tenth century Muiredach's Cross, Monasterboice. The use of panels of Ultimate La Tene scrollwork kept the tradition alive in stone well into the tenth century but in metalwork it was already in decline and examples are very rare after 900. The Ultimate La Tene style is entirely absent from the metalwork of the later eleventh and twelfth centuries, and only rarely appears in stone. This change in taste seems to have coincided with alterations in craft organization and patronage. However, the survival of the style over such a long period was due to the conservative spirit of the Celtic artist which encouraged a last flowering and thus enhanced the cultural heritage of Europe. Celtic art was the first to blossom across all of Europe, from Ireland to the Black Sea. It differs from the art of Antiquity in its decoration where curves of Greek, Etruscan and Roman plant motifs predominate, in its amalgamation of naturalistic elements, employed in imaginary combinations, and in its metamorphosis of living or abstract subjects. The development of this tendency towards abstraction ultimately leads to the transformation of the faces depicted on the coins into compositions resembling those seen in modern contemporary art. The unity of Celtic art is witnessed by the many objects preserved in museums, which were made on the Continent from the end of the fifth century to the end of the first century BCE, and in the British Isles up to and including the Christian era. This unity is explained and demonstrated in several ways. Geographically, middle Europe, between the Nordic plains and the hilly Mediterranean regions, has a temperate climate which favours not only the mysteries of the forest with its powerful and fearsome animals (deer, wolves, wild boar and snakes), but also the wealth from agriculture and stock raising, a bountiful water supply and ample resources of iron and stone. This climate is conducive to mists and clouds which beget changing, weird and monstrous forms. The sharing of one language from one end of Europe to the other reflected the common origins of the tribes that spoke it, and their works of art were infused with the same kind of spirit, which was inclined to transform living things into fleeting images. The Celts, the invaders who had become settled and who were united by their language, thus revealed a unity that was particularly propitious to artistic creation. Celtic art, like all art, was inspired by religion. The paganism of the Celts was somewhat different from that of the Greeks and the Romans and it was backed by the authority of the druids, who were the guardians of religion, writing, teaching, the calendar and culture. Their polytheism, although less advanced than that of the Romans, manifested itself through animal powers, various monsters and collective goddesses. Gods and demigods were depicted only to a limited extent and in the coins this is just beginning to be recognized. The choice of subjects also was marked by unity. Quadrupeds, birds, fish and reptiles, often precisely represented, merge with plant motifs, which lend themselves to transformations. Compositions which combined the animal and vegetal world were preferred to those depicting the human body. In fact, there are few examples of a faithful and detailed representation of the human body. But these subjects often combine to form an imaginary being, sometimes monstrous, as though everything in the world were metaphysically linked. The treatment of these subjects is a source of bafflement for, in each case, the Celts present us with riddles. The materials and techniques used by the Celts also give rise to a kind of unity. Their art, as it has come down to us in the absence of permanent architecture, consists of hard or hardened objects: metal (iron, bronze, gold and silver), stone, wood, leather, glass and clay. There is no painting (except on pottery), no wax, no wickerwork and virtually no weaving. Iron engraving and abstract sculpture in bronze both derive from the Ancient Celts who combined the techniques of engraving and sculpting most effectively. Their strong point was the creation of tiny sculptures, particularly for the embossed engraving of coinage - for which, see Celtic Coin art. Celtic art then, is pre-eminently European. 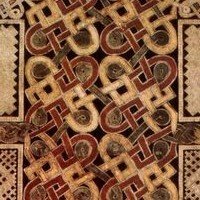 Before the advent of Christianity, central Europe had never known any other art which was adapted, as Celtic art was, to its geography and temperate climate, to a people speaking the same language and expressing both a free spirit and a propensity for transmutation and abstraction. Celtic art also was adapted to a particular setting and to rich and precious materials. Possibly a book-cover, this crucifixion plaque portrays a large central Christ with two angels above, and Stephaton and Longinus below. The clothed nature of the crucified Christ provides an extra area for all-over decoration. Large peltas with relief spiral motifs form a breast-plate, while angular zig-zag and interlace pattern the skirt of Christ's robe. Triskeles, spirals and hatching decorate the angels' wings and the outer robes of the two figures below. This "carpet" page is an example of the intricacy and ornateness achieved by artists in the early eighth century. The simplicity of the Book of Durrow "carpet" page is here forgotten as highly precise patterns and intricately woven motifs predominate. The decoration consists not only of Ultimate La Tene elements, but also of interlace, both ribbon and animal, which derive from Germanic sources. 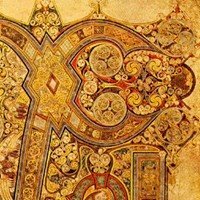 Even more elaborate than Lindesfarne Gospels,the Book of Kells is taken to mark the high point of Celtic manuscript illumination. In this manuscript the Chi-Rho is given a page to itself, and the decoration consists of panels of animal or ribbon interlace, areas of Ultimate La Tene ornament, human faces, animals, etc., all executed with the utmost precision.  For information about the cultural history of early Christian Ireland, see: Irish Art Guide.  For more on illuminated manuscripts, & Celtic-style Christian crafts, see: Homepage.